I never felt this way- we knew from the beginning that we did not want to adopt and that we could make a good life without children because we already had a good life before we started trying. I wonder too if part of it is I never imagined myself as a mother until I met Q. I didn't want kids- I wanted his kids. I think a lot of women grow up imagining themselves as mothers. Some of it is external pressure from society for sure, but some of it comes from within. If you've always assumed your life will look a certain way, it's harder to accept the life you do get. Like Turia, I always knew that I could make a good life without children and that I'd be okay at some point, regardless of outcome. During treatments, though, I really struggled with this mentality at times (and was very grateful to bloggers like you who consistently reminded me of the truth). I think it can be almost impossible to go through things like IVF and invest the enormous resources required without a very single-minded focus on the desired outcome because it was very difficult to admit that I could be throwing a truly princely sum of money and emotional bandwidth down on something that very well might not work. That being said, these sorts of comments *do* need to be challenged gently. I can't speak for anyone else, but I definitely appreciated the reminders that there was a good life beyond infertility, regardless of outcome. Here here! Love this post. I feared the no-kidding outcome more than anything else, initially, but there is such an incredible peace and so much hope for what's to come in this exciting life we get to create now that life will be different. Not better, not worse, just different. It would be wonderful to have a way to make the childfree resolution pathway more of an accepted possible path from the beginning...that when clinics or even OB/GYNs talk about IVF and donor material and adoption that they talk just as hopefully about childfree resolution, too, and not just as a terrible loss. Although there is a substantial loss piece that lies beneath the childfree resolution, the realization that you'd wanted one life and now have another. But I guess there are countless ways that could happen, too (complexities of adoption or donor, facing an illness or disability, loss of a family member or spouse, loss of a career, etc.). I definitely agree that the message that there is so much to celebrate in a life beyond infertility, without children, is so needed. I appreciate so much that you are such a strong voice for that path. I recently read about different intensities of wanting kids. When I blogged about it, the comments I got seemed to agree that during treatments, most patients experience the maximum intensity of wanting children, even if before TTC there might have been other things in life that were important, too. Yes: maybe this happens because we invest so much? Because all our time and energy is consumed by TTC? It is during that phase that a sort of view similar to the one in a tunnel is developed - at least this was my experience. All you can see is the motherhood you want. Maybe that focus is necessary in order to put up with all the doctor's appointments and shots? 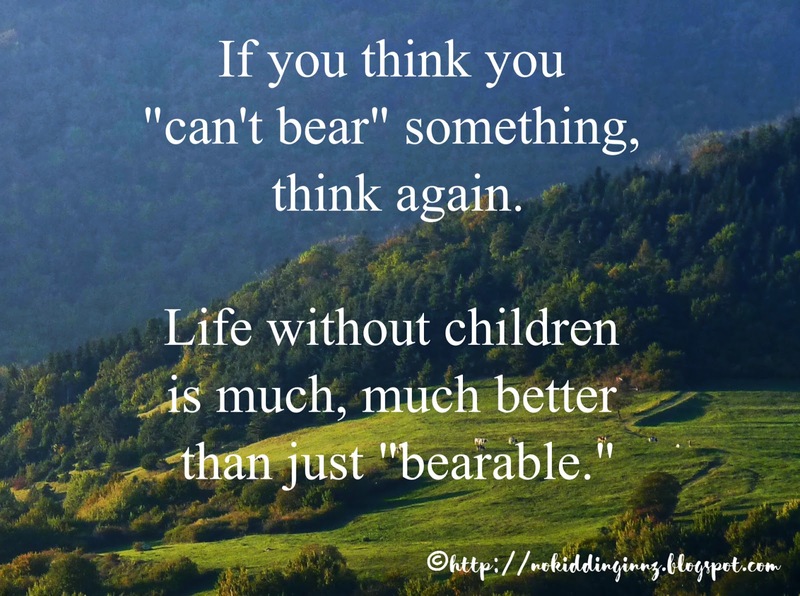 It is then that you might say - without thinking further than your actual feelings - how unbearable the thought of ending up without kids would be. In hindsight I wish I had thought more about the options of a childless/free life and looked for role models already then (or before TTC). When TTC I didn't have the capacity though. I do think it would have lessened the fear that I had of ending up without a baby. 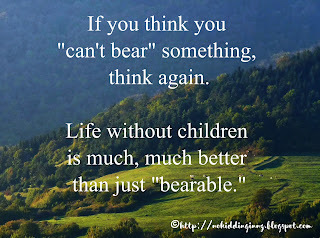 I agree with you: a life without children can be a very happy and fulfilled one. It did take some grief work for me to get there, but my life is far from just bearable now. I am grateful for my life!